Bình Định was probably one of the places where the Cham first arrived in what is now Vietnam. Its favorable geography led to the rise of the Cham Port of Thị Nại where Quy Nhon is now located. The city-state of Vijaya was located around this port and the main city, which was further inland. Its center was in the southern lowland of Bình Định. Coming to the land of martial tradition, of majestic view, of heroes, you will hear the echo of hundred years of history whispering. Bình Định, not only the land of Cham culture, the land of heroes, but also is the land of culinary. The amazing land of Bình Định will astonish you from time to time. Quy Nhơn fish rolls noodle is made from the fattest, most shining and sweet mackerels, the sweet, crystal clear broth made from bones and tuna’s head. The noodle has two type of fish rolls, the deep dried rolls, or the steamed one. The fried rolls are chewy, crunchy, and spicy and have a delicious smell of the tuna. Combined with the skull pepper, the fried tuna is better than ever. The steamed rolls are more elegant, less oil; combine with the yellow layer of egg on the outside. The rolls are soft, and not too fat like the fried. Dipping the rolls into the equally wonderful sauce, accompanying the rolls with some herbs, you will experience the best moment in the world. 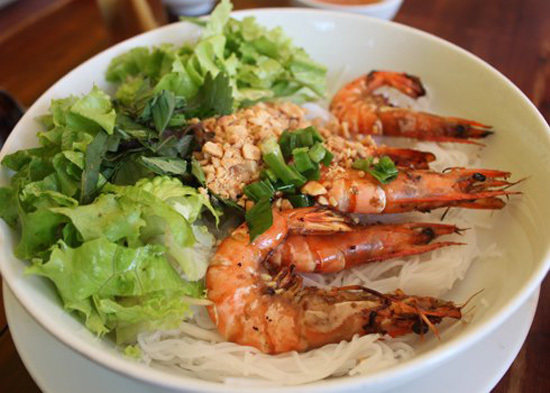 Visiting the village of Chau Tuc, you must not miss the extravagant shrimp noodle, a bucolic, yet fascinating dish. In order to have a perfect bowl of shrimp noodle, there are many processes which must be followed strictly. First is the noodle. The rice has to stay in the water until soft. Then rice is dried, and bagged and smashed. For every pot of smashed rice, there is one bag of noodle. 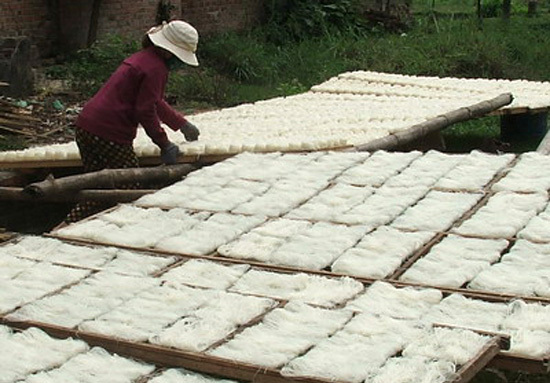 The shrimps to make the noodle are shrimps caught from Chau Truc pond. The shrimps are smashed with a little bit of salt and chili after removing the shells. Dipping everything into the boiling water, adding in some pepper, pilgrims and that is it; you have a delicious bowl of shrimp noodle. The noodle is usually eaten with grilled rice paper. The dish combines the sweet and fresh from the shrimp, the salt of the noodle, the spicy of chili, and the concentration of the onion. 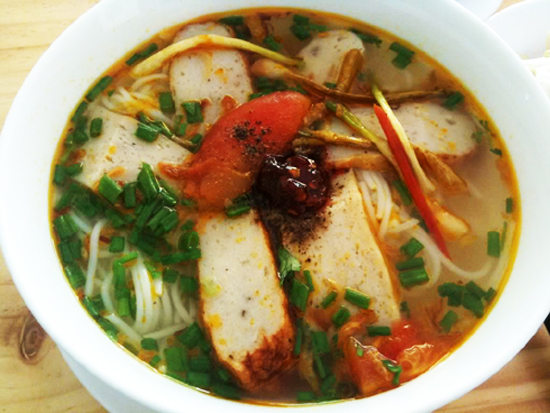 Quy Nhơn crab noodle has a special recipe which brings a unique flavor that cannot be found anywhere else. In order to have a delicious bowl of crab noodle, the crab has to be grinded, then baked into bologna. The crab is then mixed with eggs, some flour, sugar, salt, pepper and chili. Boiling the water and dropping everything inside, you will a pot of crab noodle broth. After five minutes, until the yellow crab-n-egg bologna surfaced, then you have the complete broth. You can also add in some seaweed as well. Song thằn noodle of the An Thai village has long been an unique cuisine of the land of the heroes. The noodle is extraordinary tasty and highly nutritious because the noodle is made from pea. The name comes from the way they make it: pair the noodle and tie them together (in Vietnamese, song means parallel). The noodle is made from pure smashed pea, without any flour or ingredient. Not only it is sophisticated in the making process, the drying process is equally turmoil. The noodle has to be dried under the sun of on the sand on the Con River with the heat from the sun and the breezing wind. The noodle is perfect to be cooked with shrimps, pork. It is sweet and fresh. 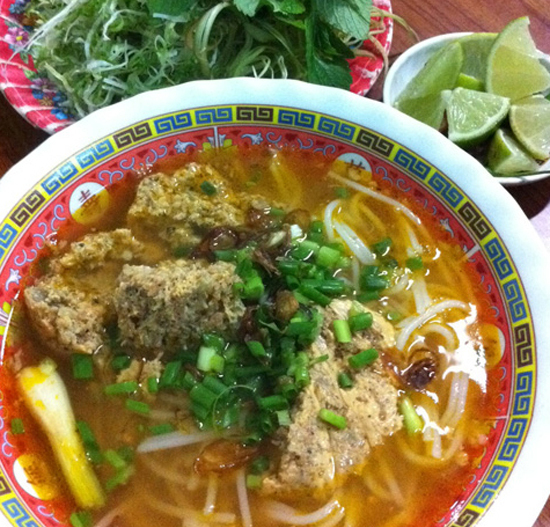 For those who visited Binh Dinh, the origin place of the noodle, remember to buy some for your friends and relatives. 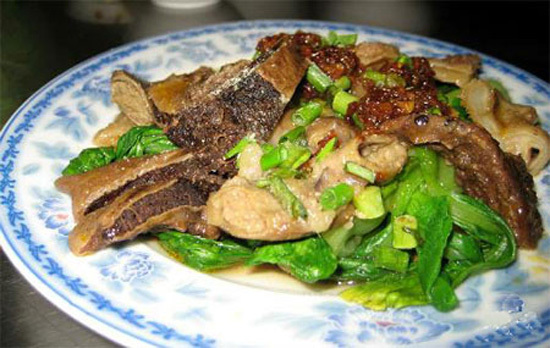 Cow small intestine is a very peculiar dish come from the An Khe and Vinh Thanh regions of the Ba Na ethic group. The main ingredient of the dish is cow small intestine. Enjoying the hot dish, with so many flavors combined, you will remember it. Adding in some noodle, herbs, sesame paper rice, chili, ginger, lemongrass, coconut milk and the cuisine is irresistible. The sea of Binh Dinh has an extensive list of seafood: shrimp, crab, squid, fish, lobster, and tuna. One special species is the King crab with the many features. The crab has a very special shell, thick and hard like armor, yellow like gold, with spikes from the back to the legs unlike many other types of crabs. 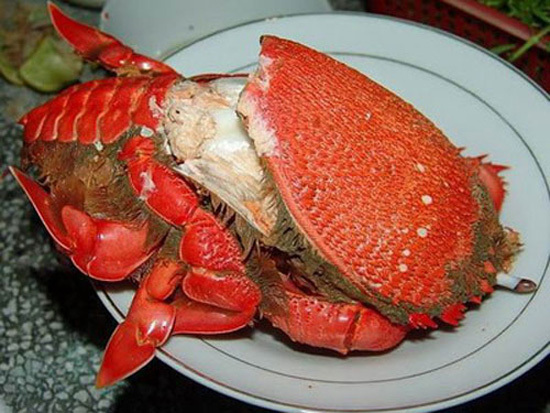 There are many cook the crab such as steamed, grilled, but the locals prefer to cook the crab with rice, or make a pot of porridge with the red of the crab brick, and the white of the crab’s meat. The meat is sweet, fresh and very nutritious. Lamprey with bamboo shoots or lamprey cooked with herbs are good for the health and could help solve the hangover problems. When cooked, use little water, stew the fish to extract the sweet water from the fish. 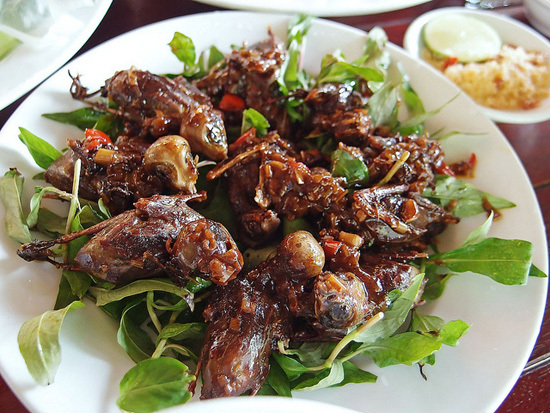 Coming to Binh Dinh, tourists will have a chance to try the peculiar sugar cane bird which can only be found in the Tay Son region, which growth a lot of sugar cane. The bird is fresh, tasty no matter what method you choose to cook it. The bird is small like sparrows but has longer legs and peak. After remove the feathers using hands and fire, the fat bird is revealed. After gutting, it is the time to spice it. The best are roasted and grilled. In order to grill it, have to cut it open, put in some spices, stick two bamboo sticks into the meat and grill it on the fire. To roasted, drop the bird into the frying peanut pan for ten minutes to have the meat turns to yellow and crunchy. Dipping the meat into the pepper-n-salt lemon mix, drinking some Binh Dinh wine are sensational experiences. Coconut trees are gifts from nature to Binh Dinh. The best of the coconut is the oil in the meat of the coconut. Not only extracting the oil, the people of Binh Dinh also know how to use the rest of the coconut to create food. The meat and the milk of the coconut are also used to make the coconut rice paper which is simple yet tasty. A bucolic, simple dish mesmerizes the heart of many tourists who come to the friendly land of Tam Quan, Binh Dinh. The rice paper is made from a mixture of rice flour, coconut milk, sesame, and salt. All are mixed, and boiled on a steamer. After that, the paper is dried for many days under the heavy sunny day until the paper is totally dried. The paper is round, and very slim. The special thing about the coconut rice paper is that even though it is slim, it is still too thick to make a roll. 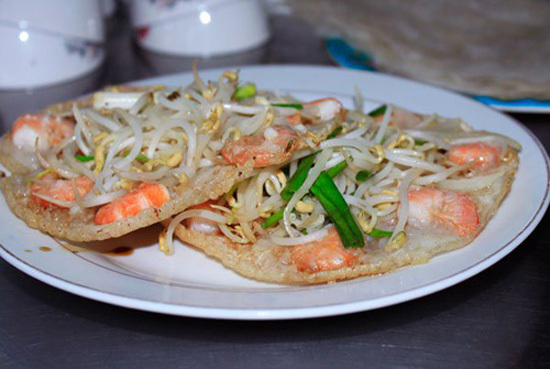 The coconut rice paper is best to eat like snack. The best part is the coconut smell tenders when it is heated. Bánh hỏi, a Vietnamese dish consisting of rice vermicelli woven into intricate bundles and often topped with chopped scallions or garlic chives sautéed in oil. They also love the dish to have some oil-cilantro mixture. 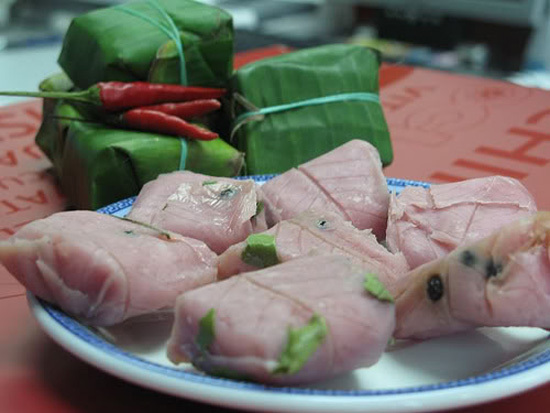 Bánh hỏi is a bucolic dish of Binh Dinh, and taste best in Dieu Tri, Tuy Phuoc. The cake is made from rice flour, and the cake is a different version of the fresh noodle. 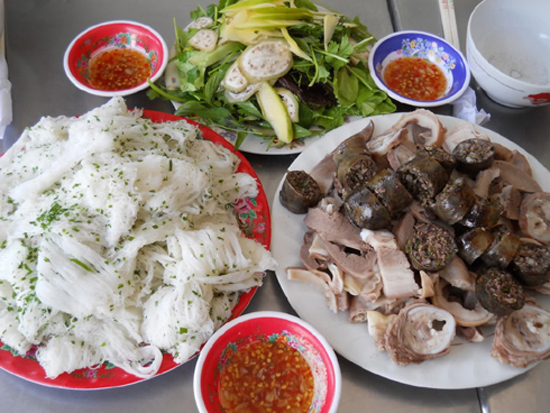 The noodle is very thick, so in order to extend the list of food, the cook has made the noodle smaller to make the Bánh hỏi. 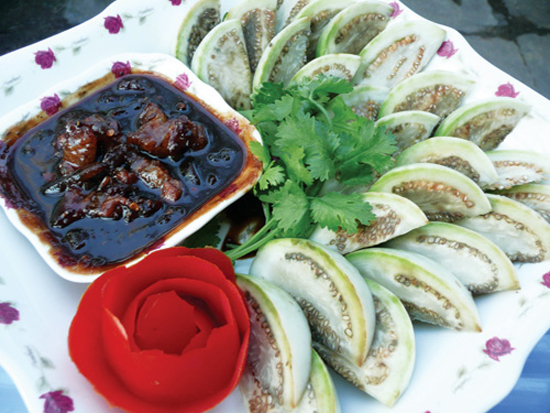 The grilled or steamed pork is usually served with the cake. The people of Binh Dinh have the cake with pig organs. The standard of Bánh hỏi, Binh Dinh version, is first to put a layer of oil including some chives leaves on the cake, to make the cake smoother and has some green on the white background. The pig organs are cut into separate pieces: heart, liver, kidney, and some slices of bacon are added in. The sauce is also important. The sauce is made from fish sauce, lemon, garlic and chili. It is also essential to have a dish of herbs to eat along with. One special feature of the dish is that it is also served with porridge mixed with minced pork. The cake makes the dish fat, the special flavors from the organs, and the sweet from the porridge are all mixed together, creating a peculiar yet wonderful dish. The pancake of My Cang is so special thanks to the ingredients that are all come from the local region. Ingredients such as rice are from the paddy fields of the East region, shrimps are from the fresh water ponds of Thi Nai, or the sauce is made from the finest fish sauce of the region. The pancakes are eaten with rice paper, a little bit of herbs, mango, and cucumber. The sweet of the shrimps, the sour of mango and raw banana, all are mixed with the special flavor of the pancakes. The My Cang pancake is not complicated, on the contrary, excitingly simple. The first layer is a thin crust, and up top is the combination of shrimps, sprouts, sliced onions, and minced cilantro. The sauce is made of fish sauce, sugar, lemon juice, and some minced garlic and chili. The pancake also needs some sprouts, sliced cucumber, and sour star fruit. All are mixed to deliver a sensational experience to the eaters. 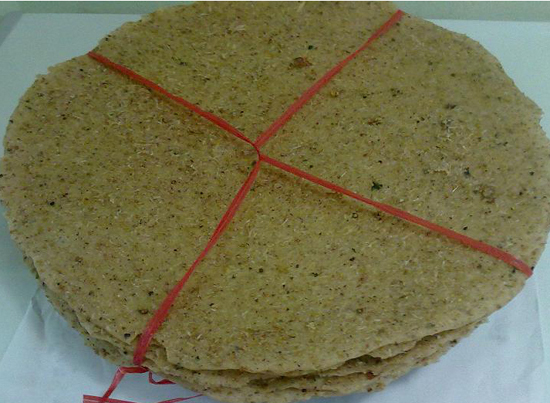 The flour cake is a bucolic symbol of the people in Binh Dinh. Nothing special in ingredients, yet explosive in flavors are what you will get when first tried this peculiar cake. 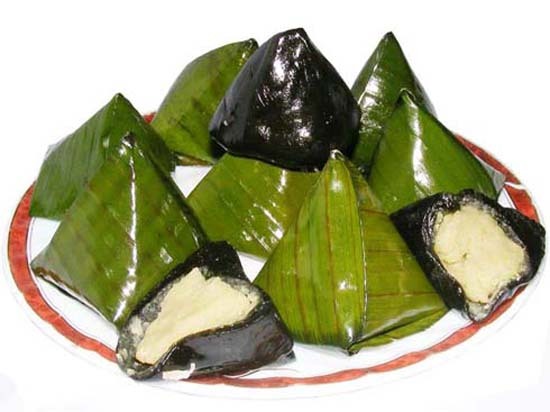 From the outside, the crust is made of sticky rice flour with prickly leaves and sugar. The inside is made of smashed pea or coconut meat. The outside is slushy, fat and sweet while the inside is spicy and bold. 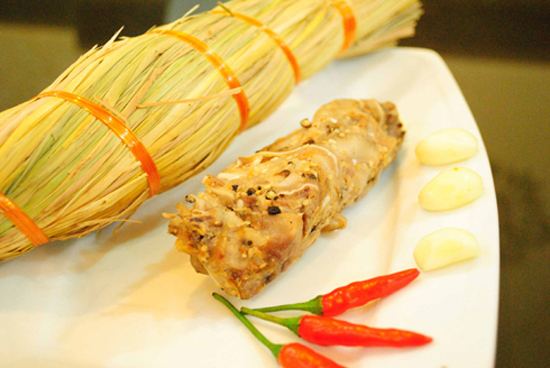 All are mixed to give you an unforgettable experience of Binh Dinh. The bologna is not only loved by the people in Binh Dinh but also the favorite of many tourists. Tasting the bologna dipped in the soybean sauce, a bit of garlic and chili, and you will feel the bold flavor. Biting a piece of the bologna, you can feel its toughness, sour and sweet combine at the same time. The bologna is perfect if it is grilled on the fire, eaten along with some coriander, shiso, cilantro, banana, star fruit, cucumber, soy sauce garlic, and chilies. The bologna can also be eaten with rice paper and coriander. The locals call it “the rolls cake.” Dipping the rolls in to a bowl of sauce, tasting it, and you will want more. Tré of Binh Dinh is remembered by everyone who came to this land by its sour, sweetness, and most importantly, its shape like a column of straw. The ingredients to make Tré are simple and home-grown: pork ears, bacon, sesame, galangal, chili, young guava leaves, and garlic. Tré is fermented naturally, after 2 to 3 days it will be automatically cooked, and the spices will be absorbed into Tré to create unique flavor of dishes. When being eaten, Tré is opened, and the meat will be separated to present on the dish. The dish can be eaten along with rice paper, herbs, cucumber banana, pickles, sliced carrot, scallion garlic, and last but not least, the fish sauce. The flavor of the dish is bold, aromatic, and sweet like the taste of the fish sauce that is used for rice, noodle, and many more special dishes of the land of Binh Dinh. The sauce is quite simple. To make the perfect, you have to buy the almost perfect tuna. The fresher is the fish, the better is the sauce. The intestine of fish is not much. 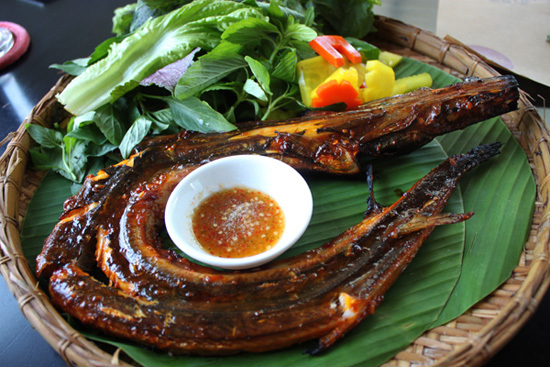 Used as a sauce to eat with hot rice, noodle, and others, the fish sauce is not to be wasted. Urchin is a sea mollusk, relative to snails. It lives in the coastal reefs of warm water, and in moss. There are many types of urchin, but the best is the black urchin of Binh Dinh. The sauce is like oil, has a black-red color, and fat. The ingredients are garlic, pepper and the urchin. The sweet and the sour are mixed together, created an interesting flavor. There are many things can eat with the sauce. The locals love to have it with fresh noodle, or with bacon and rice paper. This sauce is made to eat in the family, and sometime as a gift for friends and relatives. The special thing about the sauce is that there is not a lot of urchin to be caught every season, and it is not to be sold. 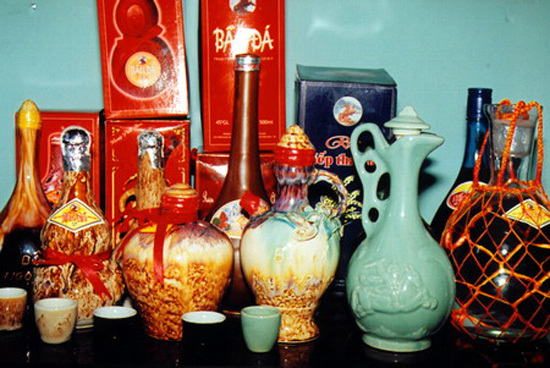 Bàu Đá wine is a special product, and also the pride of the people of Binh Dinh. This is a very strong wine, more than 50 degrees, and you can be drunk very fast with this alcohol. The wine is made solely based on a secret family formula. The water that is used to make the wine is from the creek of Bau Da village, An Nhon district. The wine doesn’t leave any side effect when drink like headache afterward. The wine is brewed using sticky rice, which makes the wine clearer, stronger, warmer, sweeter.